The last day of January has arrived. Our cold wave is moderating, and I can be grateful for that. It's actually 21 degrees F (-6 C) outside - happy dance! 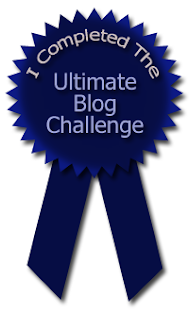 With this post, I complete another Ultimate Blog Challenge and another January, and I am grateful for both. It was a busy January, hard in a number of ways, stressful in others. My spouse and I received some wonderful news yesterday. My mother in law saw her oncologist today, and he feels that the radioactive treatment killed her cancerous tumor. He will know for sure upon one last (we hope it is last) follow up visit in April. So, we can take a very deep breath - exhale, and inhale. 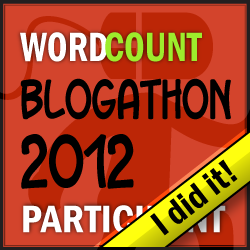 I said I would blog more about my brother in law, and then backed off a little, unsure if my readers would want that. For February, I will continue to include him in this blog from time to time. I am grateful for my friend in Brooklyn, who I haven't blogged about for a while, her husband, my guest photographer friend, my spouse and best friend, and others in my life. I am grateful for my spouse's last aunt. I won't be able to attend her 102nd birthday party and, although I saw her on Christmas Day, I would have loved to have seen her again before spring. (she lives over 150 miles from us). 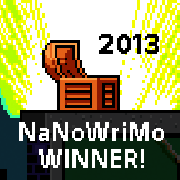 And finally, last but certainly not least, I am grateful to my readers, old and new. Before I go on to (in the words of a former boss, now retired) "the next event" I wanted to thank you all, my faithful blog readers, for your support and your comments. Even if I don't say it enough, please know that it helps me so much that you are all in my life, too. And now, onward to February! The scenes are unbelievable to many living in my area, an area that can easily get in excess of 80 inches (200 cm) of snow in a year. In fact, Binghamton, New York is one of several participants in something called the Golden Snowball award. Basically, five upstate New York cities compete for the most snow of the season. Right now, Binghamton is at some 56 inches - measured at the airport, that is. Where I live, in the Susquehanna River valley, we get a bit less. A 2 1/2 inch snowfall would hardly be noticed here. Out come the snowplows, the snow blowers, and the salt trucks. We have the equipment. For the southern United States, 2 1/2 inches of snow is a disaster. Earlier this week, Atlanta, Georgia (with a population of around 5.5 million) along with other parts of the south, were thrown into gridlock. People were stranded for up to two days on Interstates. Children slept overnight in school. Stores and people opened their homes so people could be warm. A Facebook page (or more) was created to help the stranded. I know what it can be like, because, years ago, I saw it for myself, and it's actually a reason why I now live in upstate New York. Simply stated, where there is no snow removal, the snow quickly turns to ice. And, since they have no way to deal with it, the only way these communities can deal with it is to shut down. They can do that if the event is rare. I heard, as one example, that the nearest snowplow to Savannah, Georgia is some 300 miles away. Savannah, a much smaller city, did shut down. People were told to stay home. Eventually, it would warm up. But Atlanta didn't shut down. They weren't prepared. In the South, at least 10 died from this storm. It's above freezing now in those areas of the South, but they won't be any more prepared for the next event, if you believe history. But, the climate is changing. Dispute the cause if you want, but the weather isn't what it used to be. Now, I promised you a personal story. In the winter of 1976, my spouse was in the Air Force, and stationed in Wichita Falls, TX. Wichita Falls is noted for its tornadoes and its summer heat, not its snow removal abilities. On November 13-14, a weekend, Wichita Falls received around six inches of snow. The city (of around 100,000 people) was shut down for nearly a week, because it stayed cold. And, they had to call out the National Guard. My spouse helped with the efforts. I was fortunate, as I was not working at the time. So here we are, living on the edge of the snowbelt. It isn't fun, and right now, in fact, it is two degrees above zero. Yesterday, at my son's house, it was -17. But, compared to other parts of upstate New York, it hardly snows here at all. And we do get snow emergencies. Not just with 2 1/2 inches. Climate change. Love it or hate it, we have no choice but to endure. Something interesting happens once or twice each winter here in upstate New York. 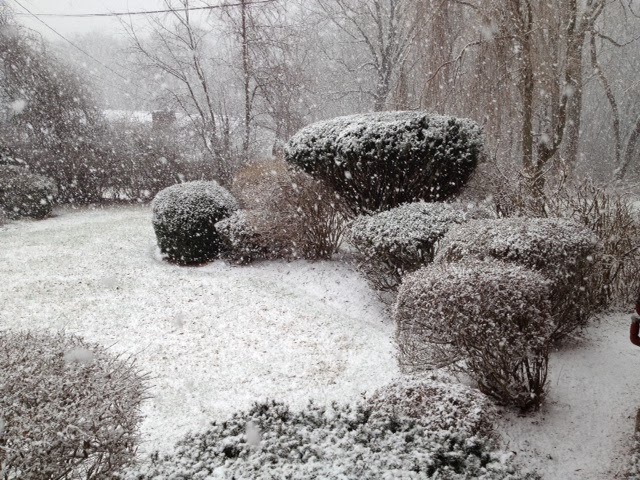 It is not this, large fakes of snow coming down so fast that you can see the snowflakes in the photo. In fact, when this picture was taken, it was above freezing - that is how fast and furious the snow was coming down. 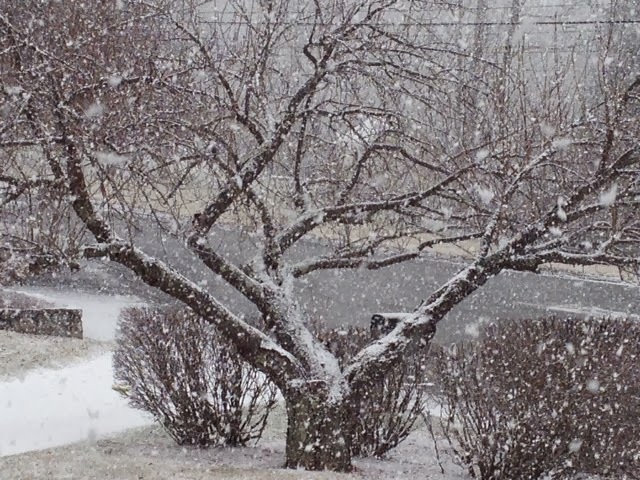 No, Oreo snow isn't this, coating every branch in sight with heavy, wet, damaging snow. No, I can't easily show you Oreo snow. This shot below is about the best I can do because I felt like I was getting frostbite in the few seconds my bare hands held my iPhone yesterday. I faced the glowing eastern horizon in the minutes before sunrise. In another part of the sky, a waning crescent moon held forth while Venus, the morning star, glowed. The conditions must be exactly right for Oreo snow. And yesterday, we had them. 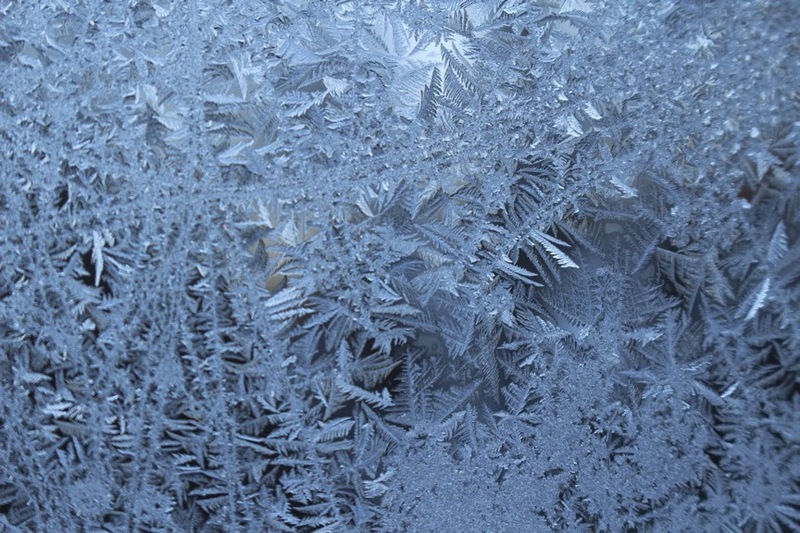 The temperature must be near, at, or just below zero F. (-17.7 Celsius). There must not be a lot of snow already on the ground, and the snow must be fairly fresh. You want just a coating, maybe 1/2 an inch or so. You don't want to be trudging through many inches or feet of the stuff. And, it must be pure white. It must be crystal clear out, with not much wind. Under these conditions, the snow becomes crunchy, almost a pleasure to walk upon. When these conditions happen(and I don't think it's my imagination, because I have noticed this for years), there is a smell released when you walk on the snow. It smells like Oreo filling. And Oreo snow made me very happy. Have you ever experienced Oreo snow? To summarize what happened, my phone was fully charged when I went to bed Saturday. It did seem to be more drained than usual when I charged it, though. Sunday morning the phone had a dead battery. After the Verizon store (our nearest Apple store is 78 miles away) could only suggest I do an early upgrade (for $$$, of course) or go to a kiosk in the mall that fixed iPhones, I texted my son (after the phone charged, which took a lonnngggg time). My son didn't figure out the cause, but came up with the cure. After several suggestions didn't work, he had me restore the factory settings. On my own, I also turned Siri [in the 4S it is worthless] off and took a couple of apps off. Rather, it may have been the calendar app on my iPhone 4S. I never did upgrade to iOS 7 because of my philosophy of "if it ain't broke, don't fix it.". And, the day the battery started to go haywire, I had gone into the calendar app just to play around with it. Why, I have no idea. I've only used it a couple of times. I will not play around in there again. "There was a huge problem with the calendar app in iOS 5 draining the battery. iOS 7 fixed that issue..[then she told me about a problem with her iPhone solved by an Apple Store Genius].My phone was replaced when the wi-fi magically quit working unless in very close proximity and the battery was draining in less than an hour. They restored it, ran a system check, and physically tested the device.... So it's worth the time. Wasted days irk me to no end. Always go to the manufacturer if you can. They know their product best. Hope this helps!!!!" 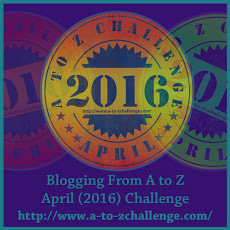 So, I am so fortunate to have Jo as a blogging buddy. When she's not busy helping me with my iPhone, she's an author, and her blog contains an amazing amount of information on the craft of writing (and designing book covers, because she's an artist, too.) Her latest book is I Zombie. I had some problems reconnecting to my home network after restoration but my son helped me with that tonight. (I don't want to imagine what he was muttering while texting me - no doubt something about "old people". Well, I love you, too.). Now, I can get back to my real problems. Saturday night I charged my iPhone 4S. It was at 100%. I went to bed. Sunday morning I woke up to a dead phone. All I could get out of it was this faint, weird symbol which somehow conveyed that the battery had no power. Yes, we all could wish for a problem like this, instead of the serious problems a lot of face. But nevertheless, it's an aggravation. So here I was, Ms. I-hate-cell-phones, who had a TracFone [non contract, pay as you go] for years and years and barely used it as it was. But, when my mother in law (who is in her mid-80's) and then my sister in law, then my cousin, then my son got iPhones, I had to get one too. Actually, I had been intrigued by iPhones for a while. I just didn't want to pay the phone bill or have a contract, but finally I broke down. What harm would it do? Well, that's what all drug addicts smart phone users say at first. Within days I was hooked, and I knew I could never go back to the TracFone. My spouse, who still barely uses his simple non smart phone, started out sarcastically by calling my phone "the magic phone". Before long, the sarcasm was gone. The phone saved us from getting lost on vacation more than once. In my recent long distance caregiving days, being able to read emails and find things online was super convenient. And the camera. Oh, the camera! I don't even use my non phone camera any more. Most of the photos you've seen on this blog since May of 2012 are from my iPhone. Until yesterday, when everything came to a screeching halt. Me: "My phone is dead." A manager: "let's take it into the back room and charge it for 45 minutes or so. Maybe it's a bad cable." We went exercise walking and returned. The phone was at 30%. I knew it should have charged up better than that in 45 minutes. The manager didn't look happy. He continued "You really should upgrade to IOS 7. In fact, if you had had the warranty, Apple wouldn't have replaced the phone unless you had upgraded." Now, I still have the original operating system from when I got the phone in late April of 2012-IOS 5 - because if something computerish isn't broke, I don't fix it. I figured I was going to get a new phone when my contract was up in April. Me: "I know people whose phones will hardly keep a charge with IOS 7, and have other problems." My son is one of these, although, overall, he likes IOS 7. We made a quick trip to the grocery, after which the phone was at 18%, in The Red Zone. It took a long time to charge the phone, while I backed it up onto my computer and took off some apps, and texted back and forth with my son, who is my tech support. Once I took it off the charger, it rapidly lost power, and it felt kind of warm. So we went back to the mall, to the kiosk the manager of the Verizon store had pointed us to, a kiosk that fixes iPhones. Except that the young man at the kiosk was out of batteries for iPhone 4S. He should have some tomorrow, he said. The young man took my phone out of the case and looked at it for about three seconds. Then he looked at me. "Why haven't you upgraded to IOS 7?" Sigh. I had already wasted part of an afternoon on this as it was but maybe IOS 7 was my fate. When I got home, I looked up "how to upgrade an iPhone 4S to IOS 7" and saw that the newest IOS7 version that came out several days ago has glitched up a lot of iPhones. Phones no longer usable as phones. Phones that didn't recognize the charging cable. Phones where the cameras didn't work. Phones whose batteries could barely keep a charge. I read that last one a couple of times, and decided to see what changing the battery ($40) would do. So I tried one last thing, which my son suggested - go back to the factory settings. It didn't work. And, I can't reconnect to my home network. One of my Facebook friends suggested, instead, that I get a TracFone until my contract runs out. Life is too short to allow this to bother me. Why did I let it rule my life for a day? On January 27, 1864, a battle was fought in beautiful Sevier County, in Eastern Tennessee, in the Smoky Mountains. Names in that area are so peaceful sounding. The French Broad River (which I've met in Asheville, North Carolina.) The Little Pigeon River. The small community near Sevierville where the battle would be fought: Fair Garden. It wasn't a major battle as battles go. It was a battle for control of fords and resources along the French Broad river, and "only" about 265 casualties resulted. The Union won, but had to retreat as they were low on supplies. Both sides, in fact, were hungry. The country superstar Dolly Parton, many years later, grew up in Sevierville. We were supposed to travel through the area in September of last year, but my spouse's rapidly growing cataract (since operated on) took care of that. There is lots to see in Sevierville. People from all over our country travel to that area of Tennessee to enjoy the natural beauty, the shopping, and other attractions. But, 150 years ago. things were way different, as our country was at war with each other. When many people think about the United States Civil War, they think of Virginia. Or perhaps, Georgia (as in "Sherman's March to the Sea"). Or, they might think of the Battle of Gettysburg, in Pennsylvania, or Antietam, in Maryland. But, as I have blogged before, the areas beyond the East Coast aren't thought of as much by many people. These Western states suffered greatly. 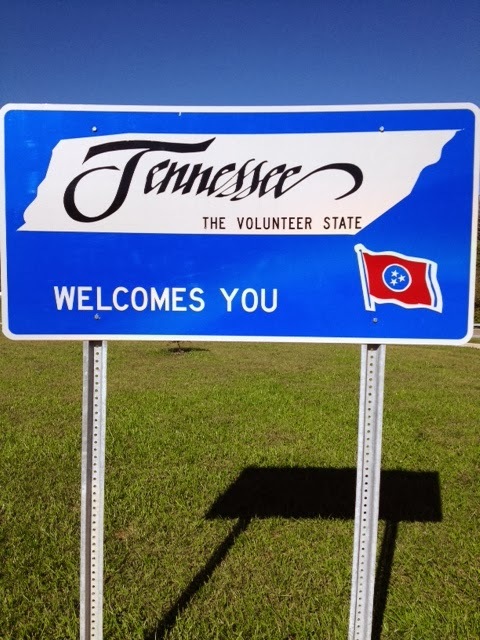 Tennessee was one of several border states (states along the United States/Confederate States border). Those states especially suffered, with their populations split in loyalties between the Confederacy and the Union. Tennessee, in fact, was the last state to secede from the Union. There were many Union supporters in the Eastern portion of the state. Sevierville was no exception. Virginia was #1 in total battles. Tennessee was #2. Tennessee was also the second most populous state in the Confederate States of America, and contributed the most soldiers to the Confederate cause except for Virginia. Meanwhile, this border state also contributed many soldiers to the Union Army.Several Confederate generals, including Nathan Bedford Forrest, came from Tennessee, as did United States' President Lincoln's second Vice President, Andrew Johnson. "Brother against brother" can be a cliche, but, in Tennessee, it was a reality. Sevierville was one of those "crossroads" communities that suffered, as the tides of war twisted and turned, and the city was harassed by both Confederate and Union troops. From Civil War to major tourist attraction 150 years later in a reunited United States, I intend to check out this area one day. Meanwhile, in a couple of weeks, I will return to the West - this time, to the remains of a town in Northwest Arkansas that no longer exists, thanks to the Civil War. My mother in law, recovering last week from surgery, wanted comfort food - a couple of her favorite soups. She is of Italian heritage, and so my spouse decided to make a soup that was fed to him when he was sleep. Many Americans know a version of this soup as "Italian Wedding Soup". (The "wedding", incidentally, refers to the marriage of the ingredients, not marriages of people.) However, in my spouse's childhood, they knew this soup as Escarole Soup. 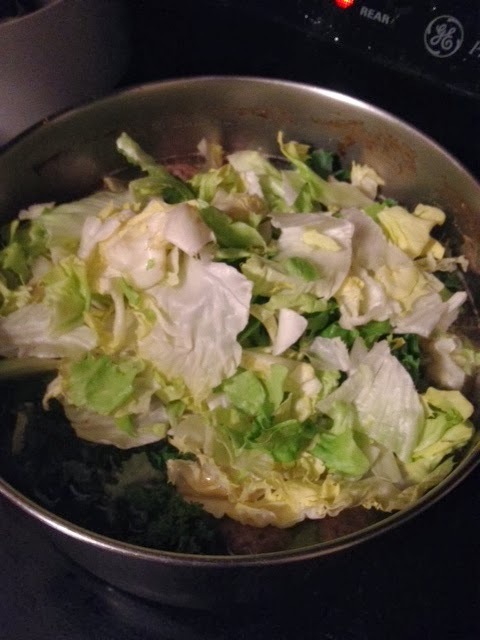 This is how my spouse and I made Escarole/Italian Wedding soup last week. Spouse strained out the bones and fat. He set aside the remaining turkey meat set aside for the other soup we were making. Next, it was time for the meatballs. 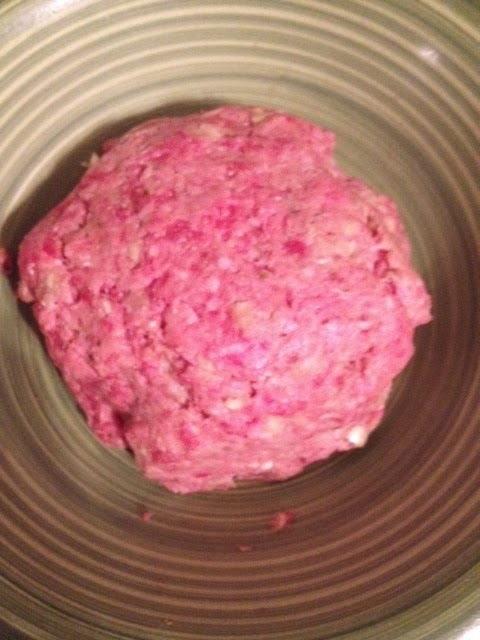 First, spouse prepared a ground meat mixture. Spouse made these from part organic ground turkey and part ground beef. As my mother in law had some Italian seasoned bread crumbs, we added that, too. 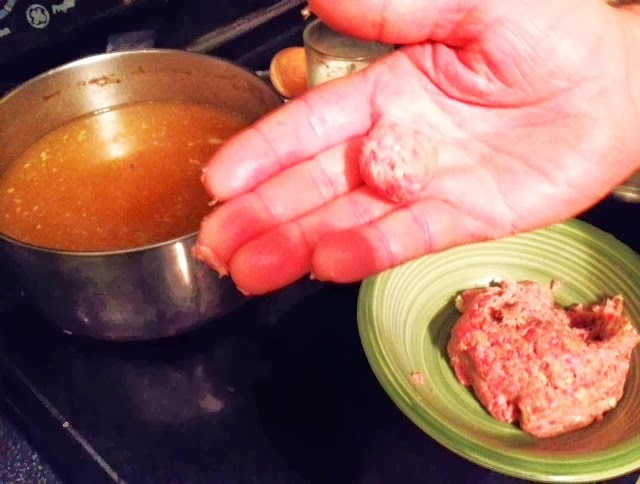 The meatballs will cook right in the soup. Next came kale, one of the most nutritious greens there is. Finally, sliced organic baby carrots (non-organic are just fine) went into the soup. My mother in law had some spinach that was a tiny bit out of date but still good for cooking, and that went in, too. Finally, pearl couscous. You can cook these right in the soup, too. If you wanted, you could add some orzo (risoni)instead. Time to marry the flavors! 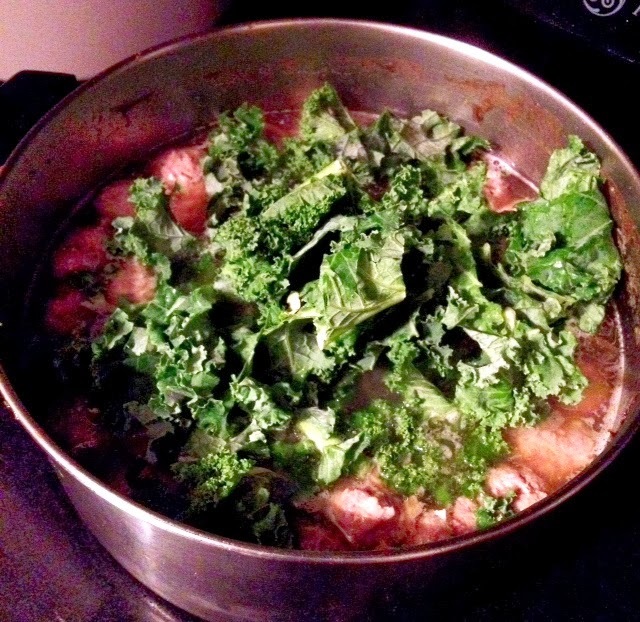 We cooked it until the greens were wilted and allowed some extra time for the flavors to blend. 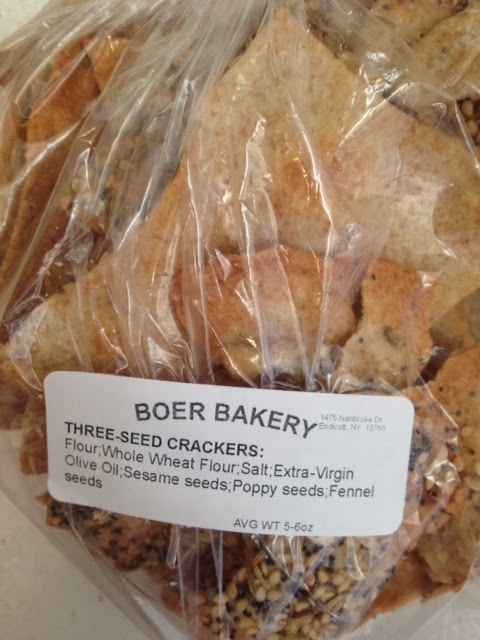 Then, it was eating time, with some Italian bread. So easy, so nutritious. And, it tasted so good. My mother in law is a good cook and she gave the soup a thumbs-up. I hope it sped my mother in law's recovery. Soup is the most sustaining food you can serve on a snowy winter day. 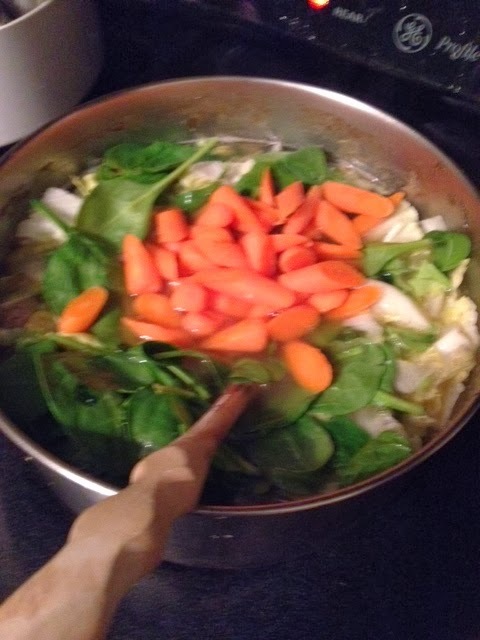 Next Saturday, I will blog about the other soup we made. What is your "go to" food when someone is not feeling well? In the summer between my freshman and sophomore years of college, I went to Manhattan with two of my high school/college friends, and watched a taping of a game show called Jeopardy! The set looked a lot smaller than I had expected, but I had a good time, and I came away wanting a job in television. (No, I never got one.) The Jeopardy! I watched being taped, incidentally, was the original Jeopardy! of the 60's and 70's - with the host Art Fleming, immortalized in the above video. For those younger than 40: yes, there was an original Jeopardy! that didn't have today's ageless host, Alex Trebek. 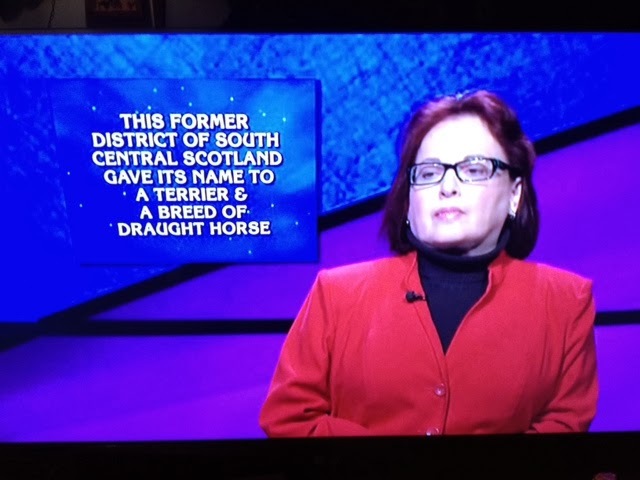 For the benefit of those who don't live in the United States, where Jeopardy! is an institution, the game is easy to explain. You choose from a game board that gives you answers. You must guess the question. The person at the end of three rounds (called Jeopardy, Double Jeopardy and Final Jeopardy) with the most money wins. It's a game of trivia, and families will gather together to play, shouting questions at the TV screen. She won her first game, beating out her two opponents in Final Jeopardy! by being the only one to question a tough answer correctly. One of them was a six game champion who is going to use some of her winnings to build a memorial to her late mother. The next night, Priscilla was on again. Someone even blogged about the game. I wish I could say she went on to win five more games. But she didn't. She came in third. She didn't get the Turtle Wax or the Rice-A-Roni. But, unlike the man in the music video, she was not a complete loser. What can you say? Many, many people were cheering for her. Priscilla and I have some things in common. We're from the Bronx. We went to the same high school. We both grew up "in the Projects" (different ones). We both escaped. She's a successful businesswoman. We are both smart, funny people. (I hope I'm funny, anyway). 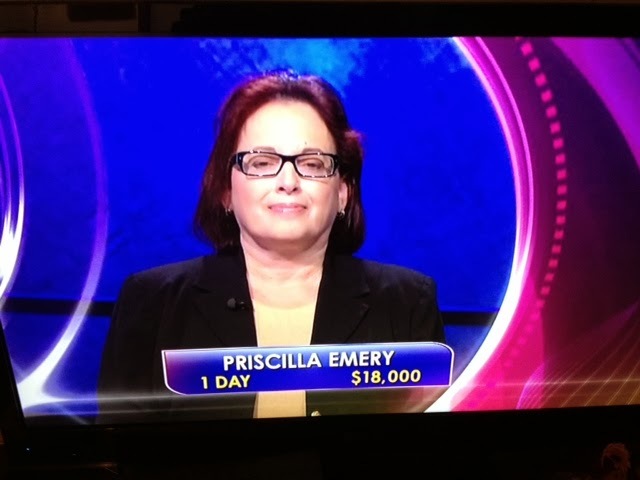 She took the leap of faith that she could succeed on Jeopardy! As far as I'm concerned, she did just that. Have you ever been on a television show? I've been a bit out of touch recently with news. It came as a sad surprise today when I found out, while doing an internet search for something totally unrelated, that a Japanese man by the name of Hiroo Onoda had died earlier this month at the age of 91. Hiroo Onoda. He isn't a household name to many Americans, but something he and a handful of other men his age did fascinated me in my childhood and early adulthood. World War II ended, for most of its combatants, in 1945. But for a number of Japanese soldiers, later called Japanese holdouts, the war never ended. Either they refused to believe it had ended or, because no one had given them orders to the contrary, they refused to surrender. From time to time, they either finally surrendered - or were shot and killed. I remember the subject of Japanese holdouts came up from time to time in various American TV programs, including the popular show Gilligan's Island. Hiroo Onoda, a Japanese intelligence officer, had been ordered to spy on American soldiers on the remote island of Lubang, and never to surrender or take his own life. He refused to surrender until 1974. Originally he was with three other men but eventually he was the last one. He emerged only after his former commander flew from Japan to convince Onoda that the war was over. Later, he formally surrendered to Philippine President Marcos, who pardoned him for his crimes. Over the years, Onoda and his men, still believing themselves at war and surrounded by enemies, had killed some thirty Filipinos. They raided local villages to survive, stealing food and killing livestock, and sometimes got into fights with the villagers. Upon his return to Japan, Onoda was hailed as a hero. I have a lot of mixed feelings about this "last of the holdouts" (noting he may not have been the last.) Over the years, I met two people. One was a woman (living in Iowa when I visited my late aunt there) who was a young girl in China during the Japanese occupation and nearly died from starvation. Another, now deceased, was a former American soldier who had survived being a Japanese POW. And, I'm sure the families and friends of those who Onoda and his men killed from 1945 until 1974 were not his biggest fans, either. On the other hand, we teach about persistence, loyalty and devotion to causes we believe in. Never give up, we teach our children. Fight for what you believe in, no matter what the odds. How many of us would have done what Onoda did? Finally, Onoda is at rest. On Saturday, I was at my mother in law's house, in a New York City suburb. We had plans for the day, including possibly taking my mother in law for a little outing. But nature had other plans. My mother in law was getting dressed (not a fast process for her). When she started, there was no snow on the ground. The next time she looked out of the window, the view looked something like this. 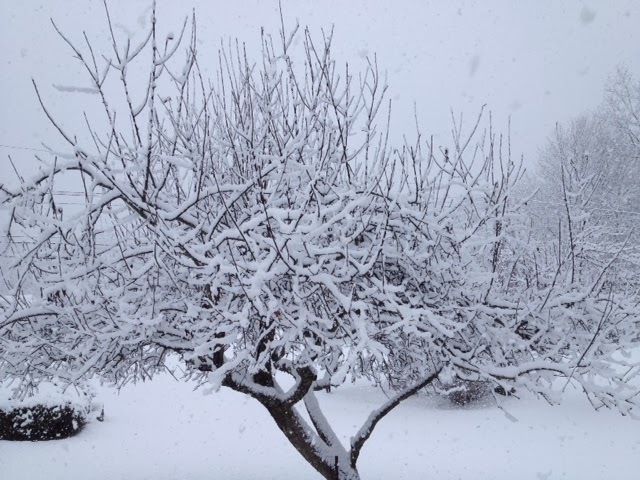 The snow came down in big flakes, so big you can see them all over this closeup picture of the same tree. 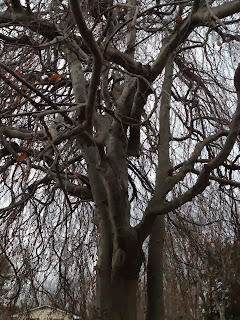 In not too long a time, the tree looked like this. 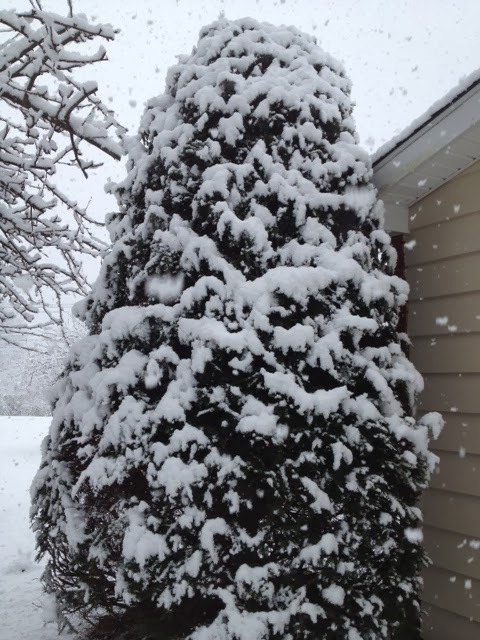 My spouse, an amateur weatherman, estimated the snow was coming down at over 1 1/2 inches an hour. Soon enough, we realized that outing wasn't going to happen, not right away, anyway, and we entertained ourselves by watching the snow. Finally, I couldn't resist, and went outside. I almost felt like a little kid, tramping around and taking pictures. The temperature was a little bit above freezing for most of this storm, but it was coming down so fast, that didn't matter. We ended up with over 4 1/2 inches (about 11.43 cm) of slippery snow. All that we had to wait for now was the snowplow. We got out later in the afternoon. It was so pretty and blue, I wish I could have taken some good pictures through the car windshield. Where I live upstate, the only time it is sunny is when it is cold. Quickly, some (but not all) of the snow started to melt. But yesterday, that area got more snow. Winter has a cold, hard grip on us after our thaw earlier this month. 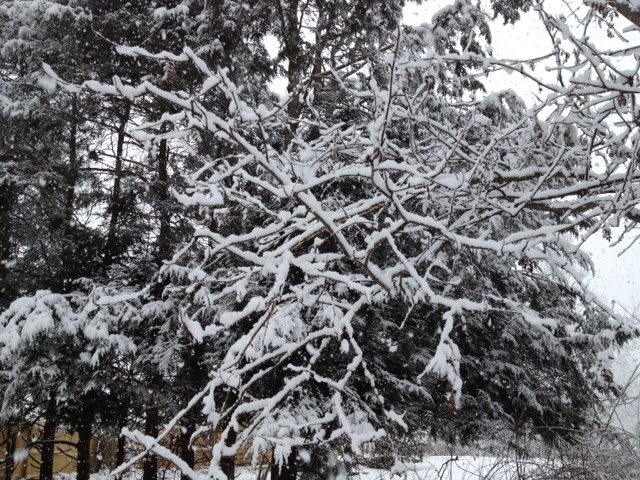 Snow sure is pretty, but right now, I would prefer some spring. Today is the 28th anniversary of my father's death. Unlike when my mother died (I was 12), my Dad died when I was an adult. As a result, I think I tend to treat my father's death anniversary with more wistfulness than pain. My Dad loved photography. In fact, he never quite forgave himself for losing a camera, with photos I'm sure he would have loved to have, at the 1939 New York Worlds Fair. When he was younger, he used to develop his own photos (in those black and white days, a home hobbyist could easily do this with patience and the right chemicals.) After his experience in World War II and subsequent marriage and fatherhood, he never did that with m, at least that I can remember. I think that's where I got my love of photography, though - from my father. What would my Dad have thought about blogging, and photography? I don't know, but I bet he would have owned a cell phone with a good digital camera just for the joy of taking pictures. Dad, you would have loved the iPhone. 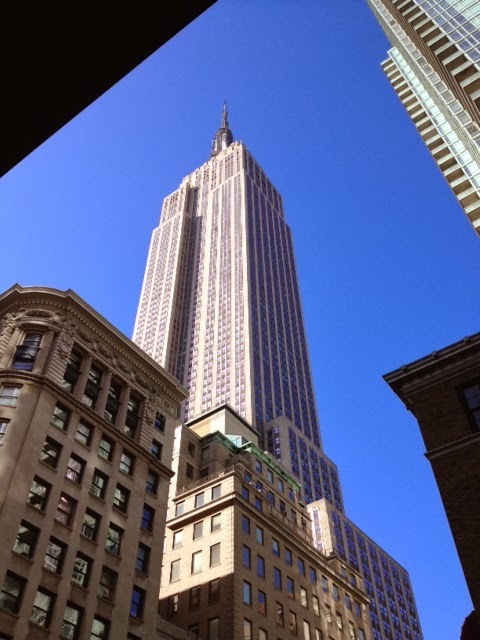 You loved Manhattan, and you could have taken this picture yourself. You loved your native Brooklyn, too. You loved to watch houses under construction. 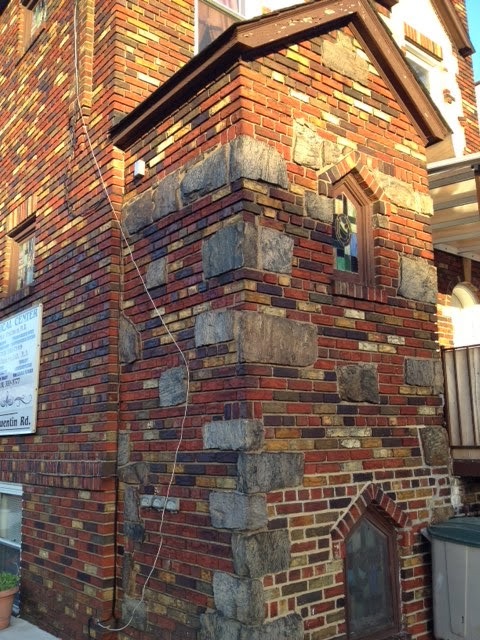 What would you have known about this style of construction? Later this year, if he had been alive, Dad would have celebrated his 100th birthday. In a way, that thought makes me smile. What, I wonder, would he have thought of our modern world? Of course, I'll never know. Happy anniversary in Heaven, Dad. It's amazing what a little cheesecake can accomplish. 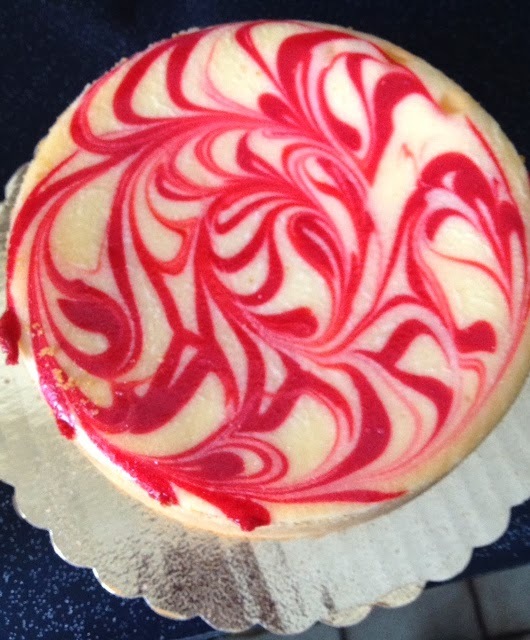 This is a little strawberry cheesecake from a bakery in Tarrytown, New York. I wish I knew the name because it was an excellent cheesecake. 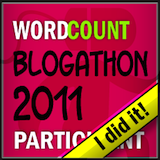 I blogged last year (I think!) that, right after my mother in law was diagnosed with cancer last December, her last living sibling fell, developed complications and died a week later - the day before my mother in law's birthday. Yesterday, her son, "J" came to visit my mother in law, my spouse, and me. J is a retired fireman, and had been caring for his late mother for years. Now (it's sad to say, but I think you all know what I mean) that she's gone, he's free. He has been absent from a lot of family gatherings and we mainly saw him at funerals. Now, we are making plans to have him come up sometime this summer. He's very friendly, and we talked about a lot of things. Over cheesecake, we laughed and joked, all of us, about cell phones and Facebook, about our children, about Weight Watchers (he's on it, I'm on it, my spouse is "sort of" on it), and about my mother in law's cancer. Why would you laugh about cancer? Because a person with cancer is just that, a person, the same person as she was the day before her diagnosis. Cancer doesn't make her a saint, or someone who needs to be treated like a special sick person. Everyone needs to laugh. Laughter is truly the "best medicine". She spoke about her oncologist, who has been so supportive. He joked with her before she was put under for the first of her two surgeries. He treated her like a human being, not a medical case. She spoke about wanting some comfort foods. Over this weekend, we had made a couple of them for her and stocked her fridge In the coming weeks I'll blog about the two soups we made for her. One was an Italian specialty. The other - well, it wasn't. And that really made me laugh. And we spoke about the cheesecake, which was made New York City style-maybe, like this. At the end of the visit, my mother in law was so happy that J had stopped by. We hopefully won't be seeing my mother in law again until February. We live 150 miles away, and will definitely keep in touch by phone. However, I hope you don't mind if I continue to blog about her and our ongoing experiences as long distance caregivers for her and her developmentally disabled son, from time to time. Isn't it wonderful what some good food and some good company can do? Winter. The southern United States has had more than its share of winter this year, especially on January 6 and 7, 2014. Minus 24 degrees F (-31 Celsius) on top of Mount Mitchell in North Carolina was the coldest. But, for places that are landmarks in the Civil War it got cold, too. (all the following temperatures are in Fahrenheit). Two above zero in Lynchburg, Virginia. Twelve above zero in Augusta, Georgia. Five above zero in Chattanooga, Tenneesee. To Confederate soldiers, they would have been a cause for alarm - so many of them were ill-fed and ill-clothed, their very survival may have been threatened. And, if you think about the regions that comprised the Confederate States of America (CSA), some of these Confederate soldiers had rarely seen significant snowfall in their lives until they became soldiers. As it happens, the winters of 1863-1864 brought severe cold weather to portions of the South, 150 years ago. But all was not grim. When troop movements brought CSA soldiers to areas with snow on the ground, they did what young men will do. Camp life could be boring, and the soldiers needed a break. How to cure that boredom? How about an epic snowball fight? There were several - one, on January 29, 1863. Another, in Dalton, Georgia, in March of 1864. These fights were complete with war strategy. Prisoners were even taken. A good time was had by many. One or two bright moments in an otherwise grim war that was about to get even grimmer. Last Saturday, I blogged about our adventure with learning to use a slow cooker to cook for our elderly mother in law, who we are giving care to during her recovery from a radiation implant surgery. Our learning project was a free range chicken - probably a roasting hen. On day one, we slow cooked the chicken and made chicken cacciatore. But then what? 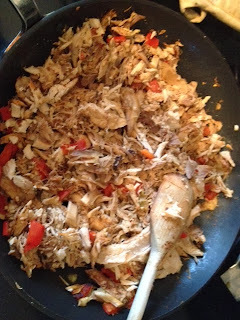 We had a lot of leftovers, and decided to make shredded chicken burritos for Sunday dinner. It would be good for my mother in law, who had an appetite, but didn't have her usual appetite last weekend. The chicken had cooked to falling apart tender in the crock pot and shredded easily. My spouse, the family cook, combined the chicken with a sauteed red pepper (to give it a "roasted red pepper" taste), and some chicken broth to moisten the mixture. Then he served the chicken in one bowl, shredded cheese in another, lettuce in still another bowl, and, finally, some homemade guacamole, for people to choose as they wanted. We served pre made salsa (from a jar, sorry) on the side. My brother in law, who has a developmental disability called autism, had never rolled a burrito. The burrito skins are circular wheat tortillas and there is a trick to rolling a burrito without it falling apart when you try to eat it. He rolled it with my spouse's help, but really didn't like the idea of a burrito. He requested seconds, but without the tortilla. 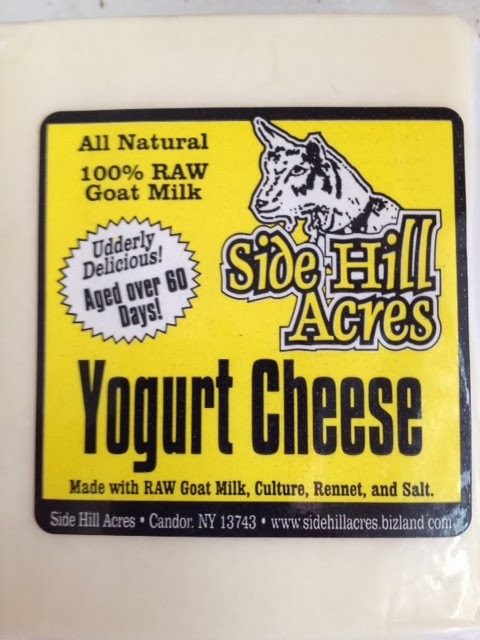 My mother in law, who is in her mid 80's, grew up in Yonkers, New York when parts of that city were still rural. She remembers merchants who would travel the streets with live chickens. Her mother would buy a live chicken and would have to do the slaughter and preparation for cooking herself. It was a much slower time, during the Great Depression, when my mother in law grew up. She has seen so much change in her 80 plus years, and has had to adjust to so much - everything from television to computers to cell phones. She's adopted many cooking conveniences and used them - the microwave, for example. But, the slow cooker, I think, was so big that its insert was too heavy for her, and she couldn't clean it in her dishwasher. It's nice for us to experiment with it, though. This weekend, we will make one of my mother in law's favorite soups (I'm not sure if we will use the slow cooker, though). Perhaps, next Saturday, I'll post that recipe. Maybe I'll even remember to take pictures. What is your favorite way to slow cook chicken? It actually wasn't a week - just four days - but my 50-something brother in law who has autism is preparing for us to take him home. At home, his mother is recovering from surgery Wednesday to remove a radioactive implant which doctors had inserted the week before. We'll have at least another couple or three days of care giving ahead of us, as we relieve another family member who has been caring for her all week. It's been an interesting (if not stressful) week for my spouse and me, and I'm sure it was interesting (and stressful) for my brother in law, too. He said to another relative today that he was happier today than when he arrived. He's been up here before, but never without his mother. (We live some 150 miles from he and his mother.) In fact, he's never been anywhere overnight (as far as I know) without his mother. Throughout his more than 50 years, his mother has been the one certainty in his life. And, sooner or later (let's hope later) she will no longer be a part of his life. Brother in law has had to deal with a lot of uncertainty in the past few weeks, something that is very difficult for him. Heck, it would be difficult for anyone. His mother's aging and decreasing mobility as she reaches her mid 80's, her cutting back on the driving which takes him into the world, her falls, her cancer diagnosis, her trips down to New York City for evaluation and then treatment, and finally, the trip up here to stay with his oldest brother (my spouse) because there wasn't going to be anyone to stay with him during his mother's latest trip to New York City. He's been asked to make a lot of adjustments. He clings to routine, as so many with autism do. In happier days, he would want to know the exact time something would happen. We'd we walking in the door to visit my mother in law and he'd be asking what time we were leaving. He would love to accompany us on shopping trips but if we told him we'd be going to the grocer, the bank and the drug store but, upon leaving the drug store, also decided to go to the post office, he'd tremble with anxiety. Now, in this era of illness he knows (to the minute) the time of each of his mother's appointments. He asked last night exactly when we will leave for home. He knows, to the hour, when the doctor's instructions will medically allow his mother to drive again. There's just one problem. Life does not run on a schedule. We don't get out of work exactly on time. The appointments change. She isn't taken on time for any of her procedures. The office giving her a PET scan didn't have contrast on hand and it took three hours for it to get there (he was waiting, at home, with anxiety). One outpatient surgery turned into a two day hospital stay. The day she resumes driving will depend on her recovery, not on a magic number listed in some post op instructions. Uncertainty. None of us like uncertainty. But my brother in law clings to routine like a survivor of a marine disaster clings to a life raft. And now, the high waves are coming faster and faster. Will his life raft be swamped? Or will he find a way to survive and thrive through the coming months? I do not envy him. It's over now but we've had an unbelievable stretch of warmish weather here in upstate New York. What an up and down January it's been! 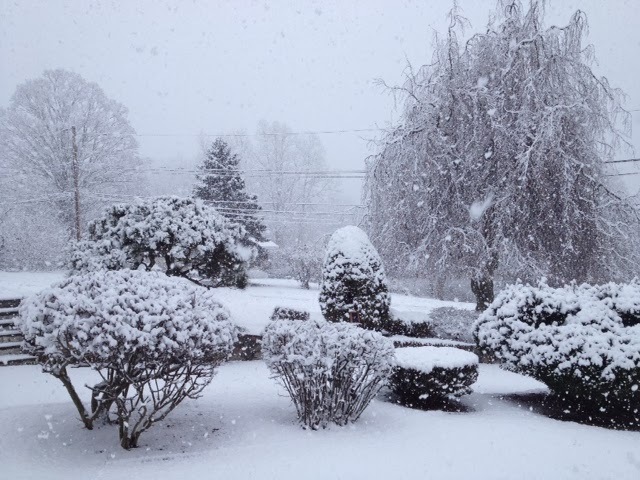 At my mother in law's house in southern New York State, it got up to 54 degrees on Sunday. I had to spend almost the entire day indoors caring for my mother in law, but I took a few minutes out to stroll around her neighborhood. What a wonderful tangle of tree trunks. 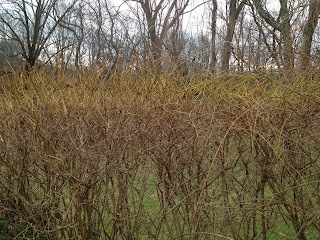 These bushes had a yellowish tint to them. 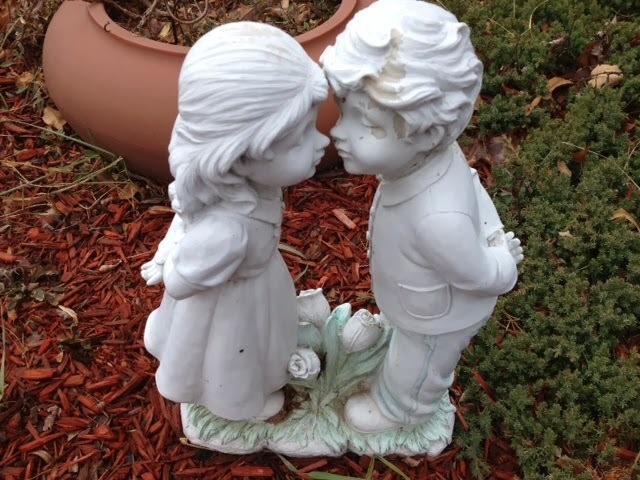 And by an empty flowerpot, a garden statue held the promise that one day, flowers would bloom again. I can hardly wait. 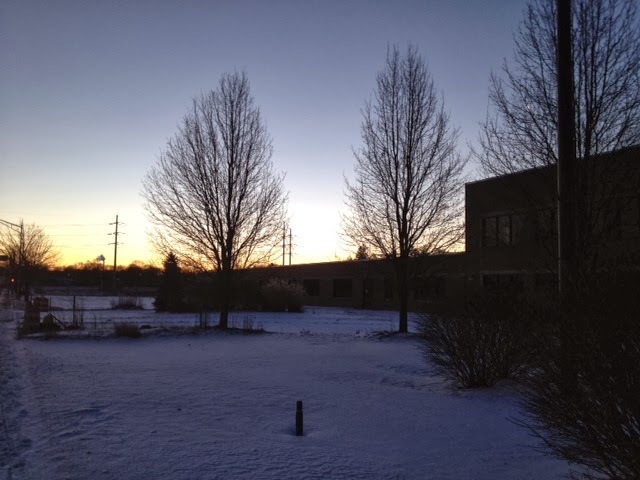 This morning, there is a dusting of snow on the ground and the high is supposed to be 32 F (0 C). Welcome to the 15th of the month and Garden Bloggers Bloom Day. 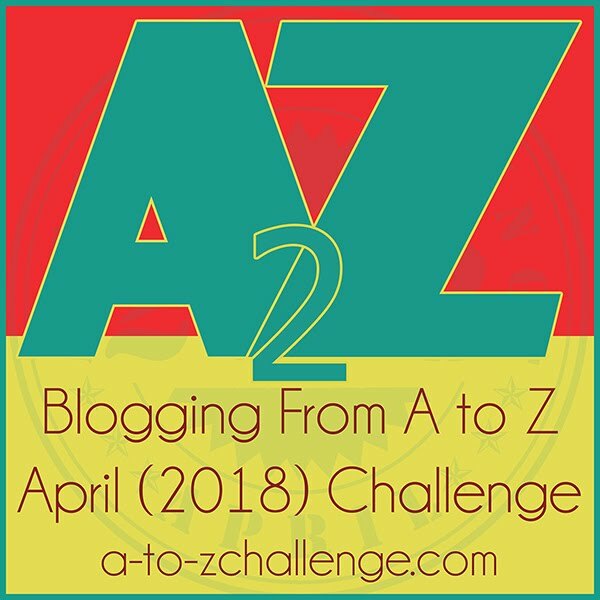 Hosted by May Dream Gardens, this monthly event brings garden bloggers from all over the world to show what is blooming in their gardens or houses. Friday, taking a 150 mile drive to my mother in law, the scenery looked like this. No flowers here. Just snow. Ice was floating in the river that followed the highway. Two days later, our high temperature where we were was 54 (12.2 C). When we came home here (a colder area) it had been 48. Even yesterday, we got up to 45 degrees (7.2 C). But soon, this will be coming to an end. I had no flowering plants in my house. I thought I would have to skip this month. But then, I took a closer look. 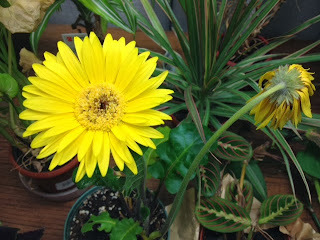 Last month, I blogged about a gift gerbera daisy that was dying in my house. 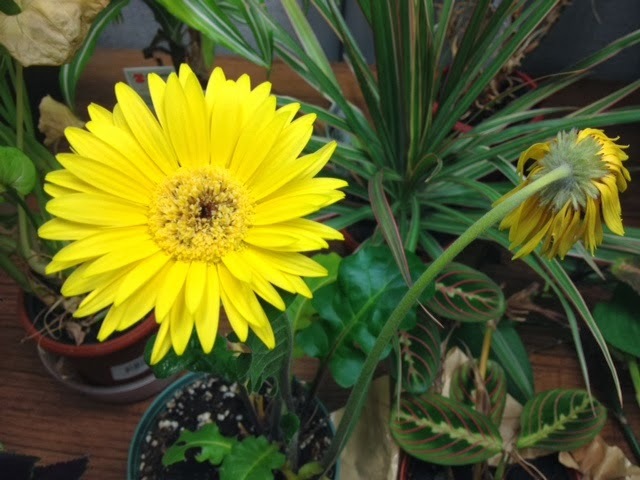 I brought it to work and it rewarded me with a bloom and a bud in time for last month's GBBD. 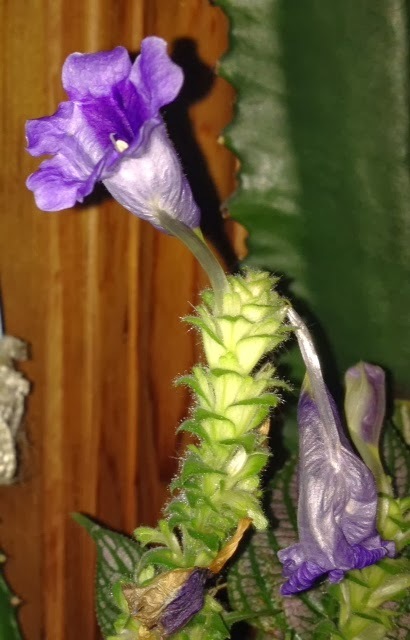 This month, the first bloom is dying and the second bloom is showing itself off. No more buds, so not sure if this is the plant's last hurrah or not. Meanwhile, at home, I had bought a primrose I intended to bring to my mother in law (she is recovering from a radiation implant surgery, as my regular readers know). At the last minute, I decided she didn't need one more plant to take care of. 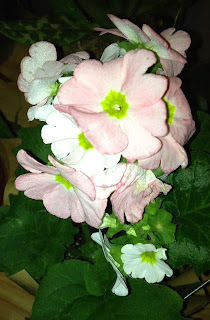 The tag doesn't give the variety but the older flowers are pinkish/salmon and the newer, opening flowers, are white. And finally, I found some flowers on my Persian Shield plants. These plants are not noted for their flowers but this is Garden Bloggers Bloom Day. And, you have to admit, they are a pretty purple. My mother in law is undergoing surgery again today, to remove her implant. I'm not in the area, but it will be busy nevertheless, as we wait for results. And now, please be sure to visit some of the other sites participating in today's Garden Bloggers Bloom Day. For the next four days my brother in law will be staying with us. This is so my sister in law can stay 24 hours a day with my mother in law, who is recovering from radiation implant surgery. She is going to have to take my mother in law Wednesday for another surgery. No one was available to be with my brother in law while my mother in law and sister in law were in a hospital in New York City. We live 150 miles away and couldn't be there for various reasons, although we had been there the past four days. And, will be returning in a few days to help care for her after this latest surgery. 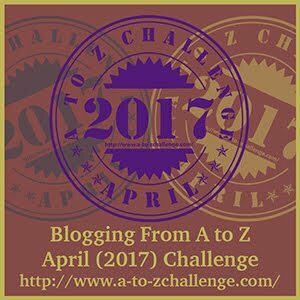 I've blogged about my brother in law several times - he is in his 50's and has a developmental disability called autism. He is set in his routines but has been up here before. Except he's only stayed with us overnight. And this is going to be an adjustment for all of us. Not just him. He watches a lot of TV and likes to be by himself most of the time. We have a small house. We have only one TV. A relative lent us another TV but we found the cable connection in my son's old room (he never had a TV up there but he had a cable connection put in there years ago) didn't work. So, last night, we were all on top of each other because he wanted TV and that was down in our living space. (Our house is smaller than some apartments). It was chaotic, I had a headache, I was receiving texts, going to an exercise class, and trying to get hold of someone (I never succeeded) along with my spouse spending time with his brother, stocking the fridge with food he liked, and showing him how our shower worked (it had changed since last time). It will be interesting to see how my brother in law adjusts to all these recent changes in his life. 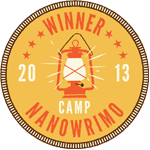 Can I blog a book? I suspect that after the next few months, I will have plenty of material. I think about people like Julie Powell, who turned her blog about trying to cook every recipe in a Julia Child cookbook into a book, and a movie. 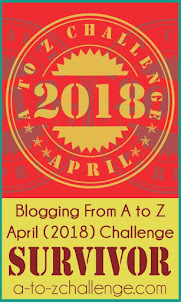 Last year, I took a book out of the library called "How to Blog a Book" by Nina Amir. 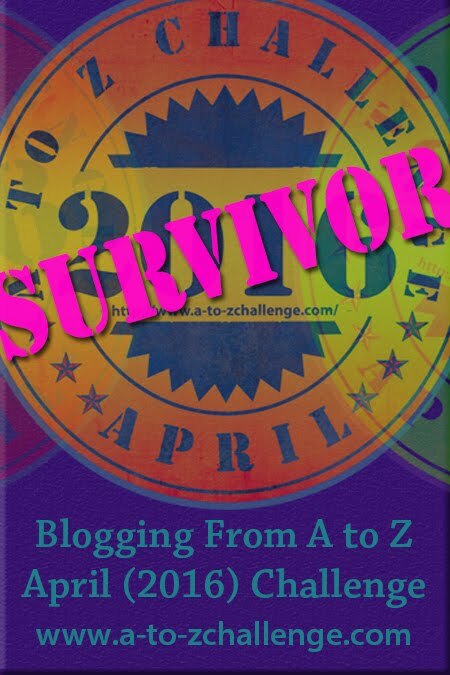 This blogger took one of her blogs and turned it into a book. The book is a step-by-step guide showing just how she did this. 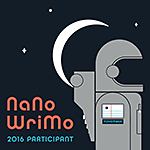 There are several things that scare me to death about the possibility of trying to write and publish a book. The writing part isn't bad. The after-writing part is. The editing part scares me because I know I will have to have it done professionally. The beta reader/people giving me honest reviews part scares me because I have too thin of a skin (and I know I have to build the tough as leather skin up soon to survive) but that kind of scared isn't like the terror to follow. The having-to-promote-it-by getting out into public and - gulp, talking to people terror. People who aren't introverted (on an introvert scale of one to 10 I am a solid 10) might not understand this. I would rather undergo a wisdom tooth extraction (which I have before, and have to again in the near future, so I don't say this lightly) than meet people and try to sell them something. Or worse, sitting in a bookstore or - a farmers market? - and no one stops. That's even worse. 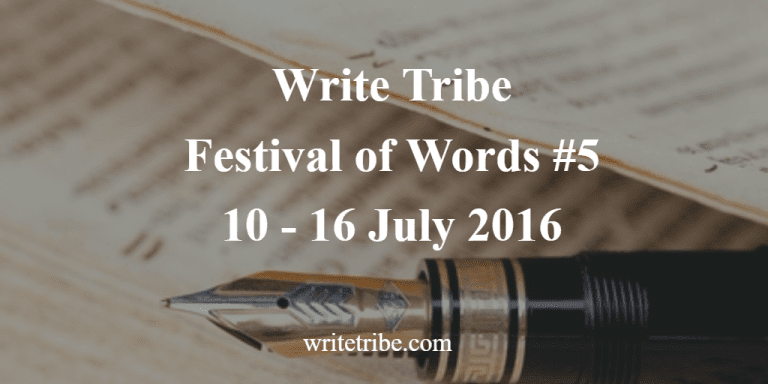 Rejection is part of an author's life, too. Who wants to be rejected? We all want to be loved, right? But we can't be loved by all of the people all of the time (with apologies to Abraham Lincoln). I've certainly learned that in 61 years of living. More thoughts about this later in the week. 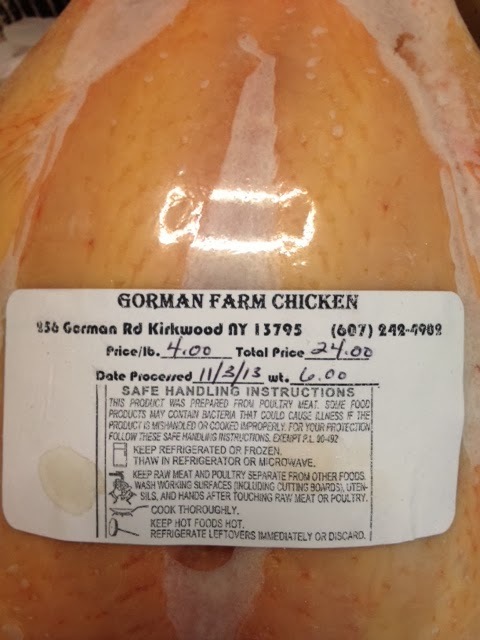 Yesterday, I blogged about our initial experiment with cooking a free range chicken for my mother in law, recovering from surgery to implant a radioactive device for her cancer treatment. Here's the crock pot. It's large, too large (and heavy) for her to use anymore. And here's the chicken. It wasn't quite a tough old hen (we knew about those, years ago when we raised our own chickens) but we figured it would need some good, slow cooking. My mother in law has an appetite (not everyone undergoing radiation treatment does), and it doesn't appear that acid food is bothering her (right now, anyway). Acid foods can be a problem for some. So spouse decided to make chicken cacciatore. Here's the recipe, kind of. First, spouse chopped up four celery stalks into chunks, along with three small onions (home grown), and three cloves of garlic from a recent farmers market. Then, he threw them into the slow cooker with the contents of a 28 oz can of crushed tomatoes that were flavored with basil. Then came a pint of boiling water. Spouse added the chicken, sprinkled dried thyme into the mixture and started to cook on high heat. After a couple of hours, he lowered the heat, added some fresh mushrooms, and cooked for about six hours total. The dark meat was fall-off-the bones tender. Somehow, the breast (the part I like) was actually a bit dry. But we both considered the meal a success. Spouse served the chicken over a mix of egg noodles and whole wheat noodles, along with some steamer green beans. 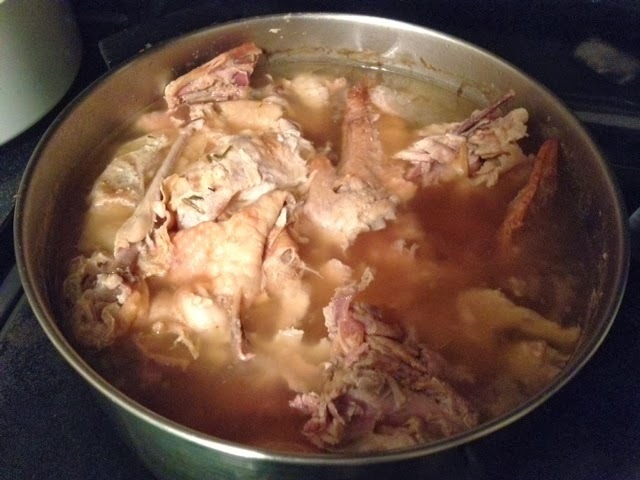 Now, a blogging friend suggested we take the bones and make bone broth with them. We do this a lot with roast turkey bones. But, with this chicken, spouse felt the chicken was so well cooked that the bone goodness would have already melted into the cacciatore. And my picture of all this cooked chicken is is where?....well, I didn't even think of taking a picture until we were almost done with dinner. Too many things to think about - too many distractions. As my iPhone is practically grafted onto me, I consider that a historic occasion! The care giving journey continues and I will be blogging on and off about it for the next week. 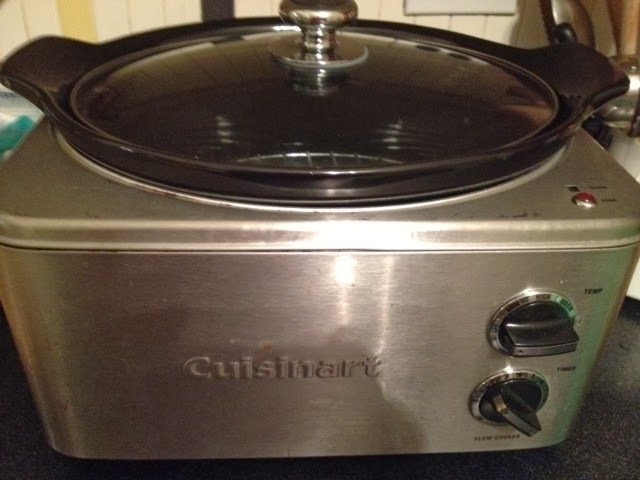 My mother in law has a gigantic crock pot, which a relative gave to her several years ago. It is too heavy for her to manage any more, and, overall, she has decreased her cooking in recent years. We knew we would have to help care for her this weekend and at time beyond, not knowing if she would have any appetite after surgery to implant a radioactive device to treat her cancer. But even if she didn't, we had my brother in law, and ourselves, to feed. Fortunately, so far, her appetite hasn't been affected that much. Cooking for someone with cancer is a new experience for us. There is an indoor farmers market about 15 minutes away from my mother in law, but we decided we wouldn't go, at least for this first visit, until we knew more about my mother in law's appetite for food. My brother in law, who is developmentally disabled with a condition called autism, is probably a lot more adventurous with foods than he might have been otherwise. Many individuals with autism eat from a small variety of foods but my mother in law always made sure he ate healthy. His favorite food is chicken. We thought of my husband (we can't leave my mother in law alone) taking his brother to the farmer's market, but the one time we did that a couple of years ago, he didn't enjoy himself. As it is, they will need to go out today for some supplies. That kind of shopping he enjoys. Our plan for today is to slow cook the chicken in the crock pot-we are not sure how, though. We've only used her crock pot once (we don't slow cook at home), and the beef cut we stewed came out so delicious, we are eager to find out how well our chicken experiment will go. We had thought about chicken cacciatore, but the tomatoes would make it acidic. Ditto for the recipes that call for Italian salad dressing. Acidic foods, apparently, are a "no-no" for this style of cooking. We'll have to figure something out that works for all of us. We'll let you know next week how our cooking experiment worked out. Do you enjoy crock pot (slow cooking) cooking? No one said it would be fun. Wednesday, my mother in law, accompanied by one of her sons and her daughter, arrived at Beth Israel hospital in Manhattan to have a radioactive device implanted to treat her cancer. She has to have it in for a week and will need to return Wednesday to have the device removed. My mother in law is in her 80's, and has some health issues. Normally, this surgery is done on an outpatient basis but due to a heart related issue, the hospital decided to keep her overnight for observation. Overall, the surgery was successful. Meanwhile, my spouse and I are some 150 miles away. Thursday, my mother in law was able to get out of bed, and the surgeon cleared her for discharge. But then, someone made the decision that a cardiologist needed to examine her and give a release before the hospital would permit discharge. I don't know "who" that someone was. It sounded like a last minute decision. To make a very long story short, it took the cardiologist some seven hours to get there while my mother in law and her family waited and waited and waited. It turns out the cardiologist, who practices in Brooklyn, had to finish her regular office hours - ending around 4pm- and then drive from Brooklyn to Manhattan (this is no quick feat, in New York City rush hour traffic.) To make a long story short, the cardiologist arrived after 5 (with my family members having waited since 10am), examined my mother in law, gave her blessing, and some 20 minutes later, my mother in law was on her way home. She arrived in good time, in good spirits, and not in any pain, all of which we are grateful for. But we ask the question: was this really necessary? Was this cardiologist the only living one in New York? We (me, my spouse, and I guess everyone else) really need to learn how to advocate and to make sure something like this does not happen next week when we have Part 2 of the surgery. The oncologists office said they really couldn't control what the hospital does. The hospital told my sister in law that the oncologist's office needed to deal with the issue. So we all must ask: WHO'S IN CHARGE HERE? Several hours into this ordeal, we got involved, not knowing what the hold up was but wanting to help, calling the oncologist's office to see if they could help, texting and calling the brother and sister at the hospital, and the brother's wife finally calling the hospital's patient representative (the oncologist's office gave me the number, once I thought of asking if they had a department like that). My husband's sister, in the meantime, had been working with a nurse on the floor. So, in talking to people since this happened, I was told by several people that my sister in law and brother in law could have signed my mother in law out rather than wait. I've now also found the website for the Beth Israel Patient Representative office. and I will review the Patient Bill of Rights. Maybe they can also help with the fact that we've been trying to reach the hospital social worker, but he does not seem to return phone calls. What would be the best way to be proactive and make sure this doesn't happen again when the surgical removal takes place next week? What questions should we ask? What resources can we take advantage of to help us with our advocacy? So we already know more than we did yesterday but need to know still more to be effective. Think fast! You just never know when your moment will come. In my 61st year, I finally achieved a moment of local fame, at least with people I know. I hadn't seen my walking partner in perhaps a month or so, where I work in downtown Binghamton, New York. I was pleased but surprised when she messaged me and asked if I wanted to walk with her to her bank. Well, I did want to get out, and out we went, fighting the wind. On a street corner, there was a young woman standing in that cold wind, next to a camera on a tripod. On the sidewalk underneath the camera was a microphone. She looked lonely. We quickly walked past her, fighting the wind, and she watched us, not saying anything. On the way back, about 10 minutes later, my walking partner (who is a very sociable person, unlike the shy yours truly) went up to the woman, and sympathized with her needing to stand there. At that point, she asked us if we wanted to be interviewed. "Only if it's quick!" my companion replied. She talked to both of us and asked me to go first. She told me to stand in an exact place and look at an exact place. And, during all this, my mind is churning away. I did have an opinion on the topic but I wanted to say something smart, or at least coherent. 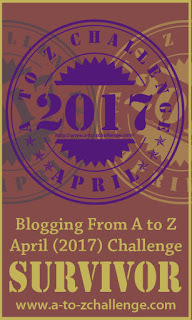 (I'm not providing a link because the topic might not be considered appropriate to a blog challenge I'm participating in). The topic is one being discussed widely here in upstate New York because we may be following some other states' paths in legalizing something (for medical use) that has been illegal throughout the United States for a long time. It turned out the reporter is originally from a state that has gone all the way in legalizing this thing. We chatted briefly. Then came the magic moment. My 15 (or 10?) seconds of fame had arrived. Would I be up to the challenge? I think I did quite well. I seem poised and yes, I was coherent. So I saw myself on TV for one of the few times in my life, and I'm told the interview was repeated three times that evening. "Gee! My new glasses look pretty nice on me, don't they?" Have you ever had a chance to be interviewed, unexpectedly? How did you do? Here in upstate New York, we've escaped the terrible ice storms that afflicted other parts of upstate New York, and other parts of our nation. However, our winters are long, and cold, and we do not escape ice all together. Ice is the enemy as far as I'm concerned. To me, ice is not nice. I've never gotten into winter sports that depend on ice, such as ice skating or ice fishing. 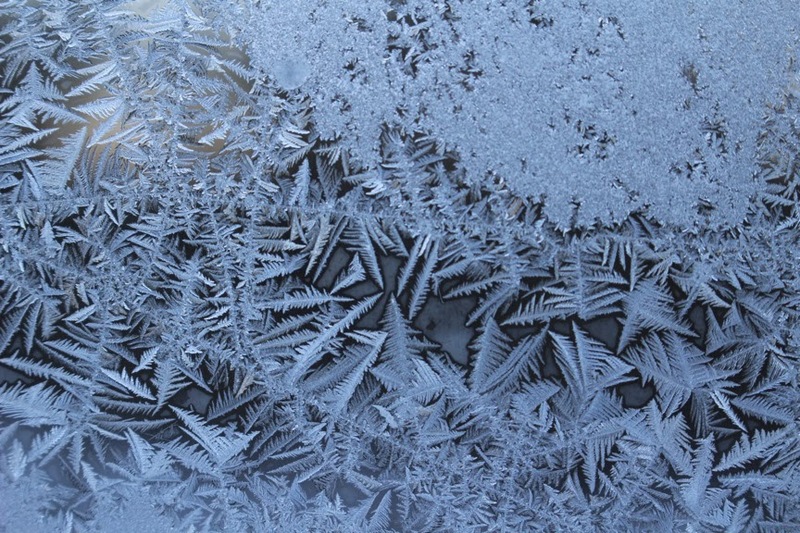 But ice can also be a thing of beauty. Nature, many times, is both beauty and danger all rolled into one package. 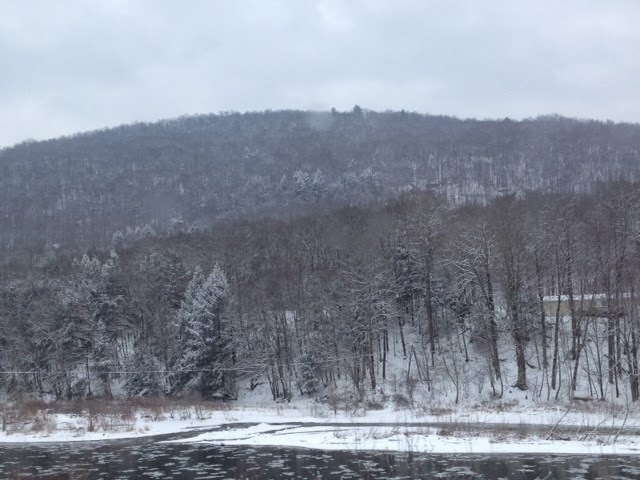 My "guest photographer", a friend who lives out in the countryside some miles from Binghamton, New York, provided me with these recent photos taken at her country home for this Wednesday's "Winter Wonders". 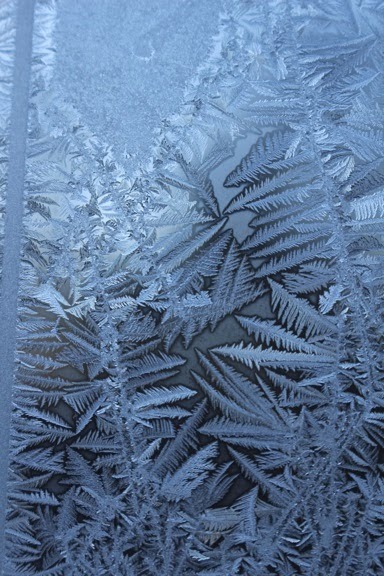 My friend calls these "ice ferns", these crystals that form on window and door glass. Here is another view. Aren't these crystals beautiful? My friend called this one an "ice garden". In a way, I can see a garden in there, even though, to me, the crystals look more like evergreen branches. Do you see a garden in this picture? I've taken a lot of pictures of snow, but haven't tried much ice photography. My iPhone doesn't focus as well on small objects as my camera used to. As I grow older (I'm 61 years old) I find my balance is not what it used to be, and I am thinking about how best to regain my balance. I fall one or two times a winter, and have been lucky that I have not hit my head. But my last winter fall jarred my spine pretty good, and I have come to dread winter. Do you (if your climate has it) enjoy winter? Life is sure full of surprises. Small surprises. 48 degrees F (8.8 C) when I woke up yesterday morning - in January. Right now it's -3 at our airport (-19.4 C) with wind chills of -23 (-30C) or more. No surprise there-it was forecast. But I walked into my exercise class last night with no fresh snow on the ground (most of last week's storm melted) and walked out to find we were in the middle of a lake effect snow squall. It won't be major for us, but parts of upstate New York may get four feet (1.21 meters) of snow. And even the cold - it's not extreme, compared to what has been happening in the middle of our country. But yesterday, we did get a surprise, in a phone call my spouse made to his mother's oncologist. We've been trying to get some information on a radioactive implant she will have implanted on Wednesday. Other relatives may have to spend two hours (or more, depending on traffic) in a car with her, transporting her home. We've been trying to find out for over a week if that will be safe for the people in the car. We still didn't get the information we needed. But, while the person who answered the phone was trying to locate someone who could answer the question, she happened to mention that my mother in law had to pay 20% of the cost of the surgery (the bill for this one doctor, I'm assuming) up front. As in, on Wednesday. Before the surgery takes place. Yes, the financial elephant in the cancer room has trumpeted. How is my mother in law going to pay for her cancer treatment? We know this is just the beginning. It's the question that occurs when you are diagnosed, but you are also trying to navigate your way through this brave new world called Long Distance Caregiving of Someone with Cancer. Which isn't as bad, granted, as the "Tag, You're It! You have cancer!" announcement that my mother in law got back late last year. It's the same question that each and every person diagnosed with cancer in our country must answer, one way or the other. 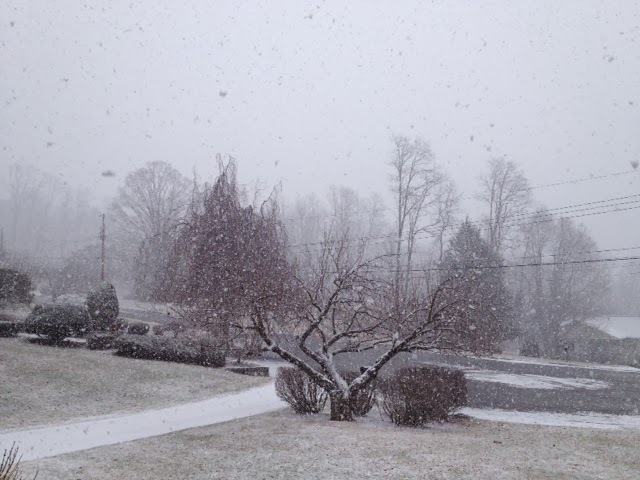 It's not like an unexpected squall of snow or a short below zero cold wave. But, it's just one more item on this list of worries we are accumulating and want to shield my mother in law from. The elephant is waiting, in a room in New York City, and he is demanding to be fed. Yesterday, we put our Christmas tree away. Years ago, we had an annual ritual with our young son. We drove to a Christmas tree farm near us and sawed down a small evergreen tree for our small living room. Decorated, it made our lives more beautiful for some three weeks. Then we took it to a local landfill, where it was turned into compost. For years, we have debated "natural vs. artificial" tree. Both have advantages and disadvantages. With our son, it ended up we had to go artificial due to one of his allergies. We've kept it artificial even after he left the house. 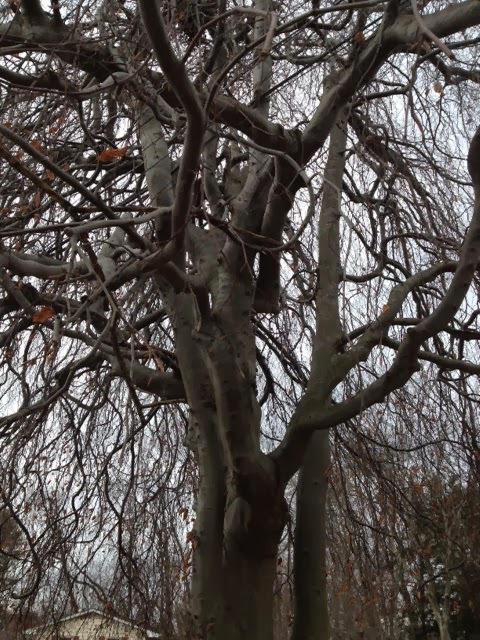 What happens to all those natural trees at the end of the season? Have you wondered the uses they could be put to? Well, you could make a big cat very happy. There are other ways for used Christmas trees to have second lives. Helping to stabilize dunes along the shore. Do you have a Christmas tree? Natural or artificial? If natural, what do you do with it when the season is over? Like many, I am mourning the death of Phil Everly, one half of the singing Everly Brothers. Their songs formed some of my childhood, and my mother owned "Wake Up Little Suzie" on a 78 rpm record. 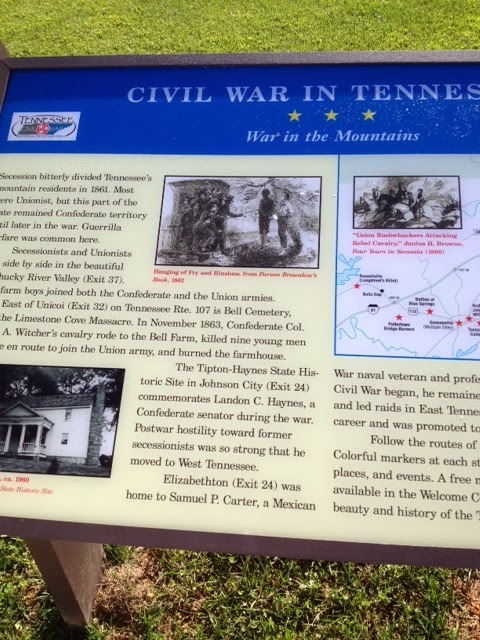 I wanted so much to blog about the Everly Brothers and their music, but today was Civil War Sunday, and I needed to write about the Civil War - right? Turns out I can do both. Phil Everly owned an antebellum house outside of Nashville, Tennessee, once called the Galloway House. Built in 1846, it needed renovation when Phil Everly bought it 14 years ago. According to interviews Everly gave, it took 10 years for him to renovate the house. The former Galloway House is part of a tour of Nathan Bedford Forrest sites near Nashville. Forrest is a controversial figure in Civil War and post-Civil War history. I will leave it to my readers to find out more about the history and deeds of this man, good or ill. One thing sources agree on, though, is that Forrest had a hot temper. According to Everly, Confederate General Nathan Bedford Forrest got into an argument with one Lt. Andrew Gould in June of 1863, and ended up fatally wounding the 23 year old Gould (accounts say, in self-defense). Sorry for his actions, Forrest paid for medical care for Gould but Gould died after an almost two week fight for life. Wounded himself, Forrest recuperated in a second floor room in the Galloway House. In a Wall Street Journal article, Everly said "I suppose there is a song in that story someplace." Let us remember Phil Everly by listening to some of their music. And, the song on my Mom's 78rpm record, Wake Up Little Suzie. It's so hard to believe that this song was banned in several cities in the United States. You can learn about the Civil War in ways you never expected.